Looks super delicious! Great picture. I love different Asian dishes. I have not used that type of noodle before. I will have to try it. What a beautiful dish. I love the instruction, great push for me to use some things I don’t regularly cook with. Oh does this really look like a perfect dinner treat. Have you tried toasted sesame seeds or the black sesame seeds? I love the smell of sesame oil as it heats up in the pan and would add a little to the other oil, Canola in this case to impart a bit of the sesame flavor during the onion and carrot saute. Wow, super speedy! I have to keep my eye out for those noodles—and I love the colors with the bell peppers and the peas! Lovely. Yum!!! I am going to look for those noodles. Sweet potatoes are so much healthier than white rice noodles and mung beans are supposed to be really good for you, too. I’m with you on the ‘wonderful hot or cold’ – sometimes I can’t resist leftovers for breakfast right out of the fridge. I have never eaten Jap Chae before, but now, after this post, I see that it is a MUST! I love stuff like this! I am with you – I always love to put a little heat it. Have you tried sesame oil that’s been infused with hot chili? You would love it I’ll bet! I second the notion that Korean food is out of this world! This looks great. Lovin the agave nectar idea. I’m heading over to 99 Ranch market in a couple of weeks to stock up on all of my Asian ingredients. I think my China trip is going to be very inspiring. You had me at sweet potato noodles! What an interesting dish! It looks light, flavourful and yummy. I’m a big fan of Korean food and this looks yummy. A bowl of this and a little kimchee and I’d be in heaven! MMm. Haven’t made much in the way of Korean food at home, but I’m definitely a fan. And noodle bowls are some of my favorites. I also didn’t know that cellophane noodles were made from sweet potato starch! How fascinating! Will definitely be checking for these on my next trip to the Asian market. Sounds perfect for dinner tonight (if I only had all the ingredients at home right now)! I’ll definitely have to bookmark this for later. Oh I’ve never heard of this but wow, it looks great! Personally, I love Asian food of any kind! This looks like a winning combination! I did not know about sweet potato noodles but will have to look next time I get to Chinatown. Thanks for this recipe. This sounds fantastic, and I love that you beat the frozen pizza! I’ve never cooked with cellophane noodles, but I love them and need to search them out at the Asian grocery store. I had no idea they were made with sweet potatoes – how cool! magnificiant colors love the noodles! I love these noodles. It hadn’t crossed my mind that they were gluten free, so that’s a pretty good bonus! Alta, I had no idea the glass noodles were made from sweet potatoes … how cool! You’re right about the number of noodles in the Asian stores. I’ve looked before and been intimidated. (I go to the Asian market to pick up finely ground rice flour, coconut milk, some veggies, etc.) Great-looking dish and to be that speedy–nice! I also like that it’s a dish that’s great hot or cold. I made the Chop Chae recipe from Mark Bittman’s “How to Cook Everything” the other night. Turned out delicious! Yum Alta! So simple and soo delicious! This sounds like a delicious specialty! I would love the sweet potato noodles! Wow….Korean dish from you….brilliant! It looks very delicious. This dish is one of my favourite Korean dishes….yum. looks very delicious – nice! You have made the glass noodle looks more beautiful than it is uncooked. I love to cook this dish with Korean chilli paste, but adore this healthier version as well. AmandaonMaui – I LOVE that Mark Bittman book! I practically learned how to cook from it. Must have skipped past the Chop Chae all those years ago – now I have to go back and check it out again! Tasty Trix – haven’t seen chili-infused sesame oil. DEFINITELY need to check that out! CCR – I love toasted sesame seeds – and black ones too! I don’t normally cook with sesame oil in the frying step, because the sesame oils I have are low-medium heat only. If I can find a more refined sesame oil, I’d certainly give it a try though! TasteHongKong, diva, MaryMoh, Natasha, Lauren, Shirley, Janice, Leslie, Conor, pegasuslegend, Katie, Danielle, jenn, SimplyLife, Lisaiscooking, lo, lvegas, Rochelle, Angie, Emily, Amy, Stacy, Cristie, Noelle, Teanna, MyMansBelly, and The Chickenless Chick – Thank you so much! I do have some of these noodles in my cupboard. Now, it reminds me I have to use them. They look fantastic with all the colorful vegetables. Wow this looks incredibly healthy. Going to have to go on a noodle hunt! The dish looks delicious… love a healthy quick to prepare meal. Yum, I haven’t had jap chae in ages — I also love those sweet potato noodles for all those same reasons! Been on an Asian food kick lately, so I may have to make up a batch of this soon!! This looks amazing! I can’t wait to have a go! Alta I LOOOOOOVE Jap Chae!!!!!!! Beautiful picture btw, it instantly made my mouth water…and then my tummy grumbly 😦 You are right, the shiitake mushrooms are such an integral part to this dish, I love the texture of the vegetables with the chewiness of the noodles and that sweet soy based sauce that brings it all together — beautiful post! I love these types of noodles so light and they absorb so much flavor. Nice job on this post! I’m with Kathy on this … add some Dae Ji Bulgogi, Kim Chi, and steamed rice and I’d be in heaven! It’s one of my comfort foods along with kimchi! 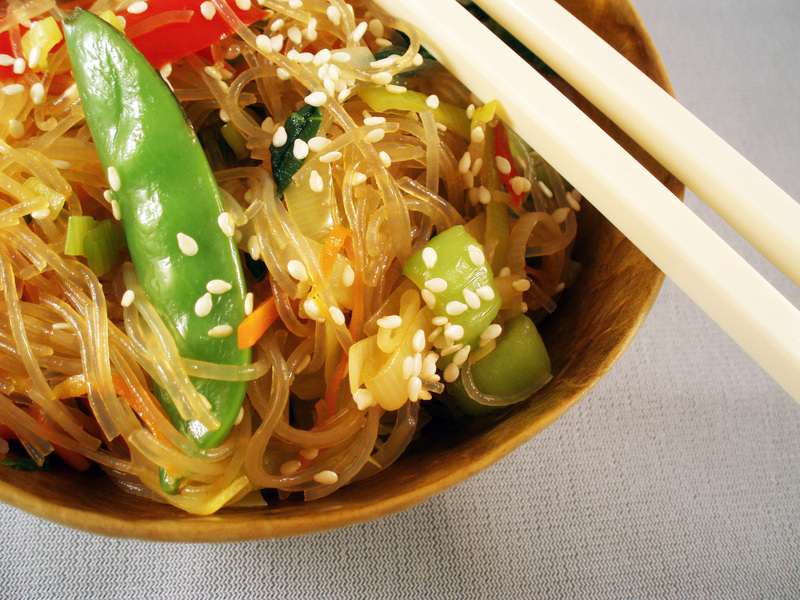 We’ve never made jap chae, but it looks great. The noodles sound really interesting. I’d slap some tofu on that and dinner is served. A+ picture, too! You had better believe I’m searching out this noodle at my new favorite place to shop, lol!! The Asian grocer, Yeah!!! Thanks for this recipe Alta, looks so good!! mmm, one of my favorite Korean dishes but I’ve never tried making it before, thanks for sharing! OMG! I’ve been wanting to make this. You’re making me hungry right now! Thanks for the recipe. Will make it for my hubby this week. We love Korean food! YUM!!! All of your recipes look so delicious! I miss Chinese/Japanese (I can’t do soy – but LOVE the new soy-free subs that are now available!) I’m going to try this soon! I love those glass noodles! I looove sweet potato noodles. Definitely going to try this one! My husband and I absolutely loved this recipe! Thank you so much for posting this!